We’re employee benefits advisors and brokers who want you to be successful, not just a client. If you’re expecting a spreadsheet of options, know that Broad Reach Benefits is different. Our main focus is to help you improve your company’s performance and keep you work force healthy and efficient. Here at Broad Reach Benefits, we’ve worked diligently to develop a completely different business model, with client relationships at the center of what we do. That’s what makes us successful and what makes our clients happy. Instead of being just a name that provides options, we work with you and your specific goals to make your benefits plans work like they should. At the end of the year, when it’s time to make budgeting decisions, we don’t pull any punches, leaving you surprised. If ever there is a change needed, you’ll know immediately, not at the end of the year. Our working model of close communication will make the process easier and more cost-effective. Before making any decisions, see the results of an independent consultant who surveyed a cross-section of our clients to find out how they felt about working with us. We have an experienced team of advisors and employee benefits brokers who are dedicated to assisting your organization with granular control of your benefits, while lowering employee benefit costs overall. Keeping costs manageable is one thing, but we have your best interests in mind and strive to keep your employees and their families protected. As employee benefits advisors and brokers for NY State organizations and businesses, our firm specializes in working with organizations that have between 30 and 500 benefit-eligible employees. 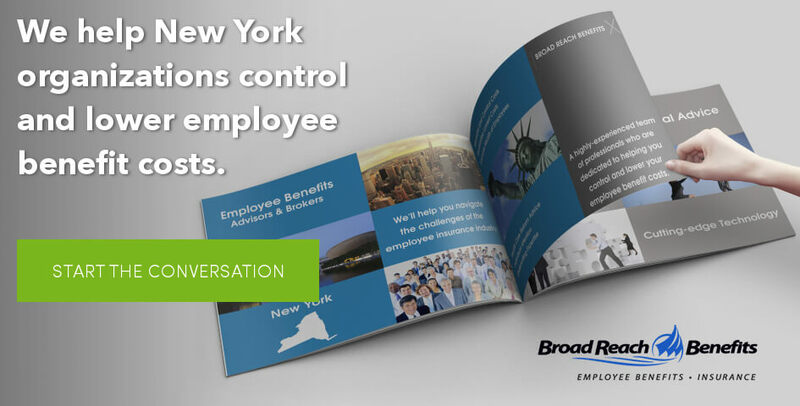 Broad Reach benefits is an employee benefits advisory and brokerage firm that offers New York state businesses and organizations employee benefits products and services. Navigating the many challenges of the employee insurance industry is something that we do and do well. We’ve been doing it long enough to know that as a business owner you want to keep costs manageable and keep your employees happy. While you focus on your business, we’ll focus on the challenges and details of benefits and insurance so that your business can continue to grow. Whether your business is focused on small/medium sized business, manufacturing, technology, retail, finance, real estate, construction, services, or otherwise, we are dedicated to working closely with you and your organization in order to thoughtfully analyze your needs, set and meet manageable employer/employee goals, all while streamlining the costs in a manner that protects your business. Health and wellness based strategies that improve the health of your workforce and reduce costs. Health Care Reform advice and oversight. You’ll understand all your options and know exactly what you have to do to remain compliant. The “A” team. Unlike large big-box brokerage and consulting firms, we specialize in working with employers with fewer than 500 employees. You always get our “A” team and are never handed off to the “B” or “C” team once you sign on the dotted line. Contact us today for a free report on what other New York employers look for in an employee benefits broker. Employers today are facing new challenges and significant market and regulatory uncertainty in managing their businesses. It’s therefore not surprising to see that the 5,536 employers that responded to our Broker Services Survey are expecting more service, support, technology and of course advice from their insurance brokers. We’ll provide you with a free copy of our Broker Services Survey so that you can learn what other employers are looking for in their insurance broker relationships. Enter your information below and we’ll email you a free copy of our Broker Services Survey. Besides delivering a spreadsheet, is your employee benefits broker really doing anything for you? Does your broker “shop” the market each year? Simply shopping each year for medical coverage and comparing the costs between carriers does not address the underlying issues that are specific to your employee population and driving your rate increases. We’ll identify the cost drivers within your population and implement strategies which will control costs and lower the trajectory of future rate increases from the carriers. The Broad Reach Benefits Difference- Individual attention, not institutional customer service that is transactional in nature. We’ll provide you with employee benefits consulting, actuarial and underwriting expertise, access to diversified domestic and international products, cutting-edge technology and fanatical customer service that will reduce the amount of time you spend administering your benefits and improve your company’s bottom-line performance. To learn more about the Broad Reach Benefits difference we invite you to talk with our current clients.